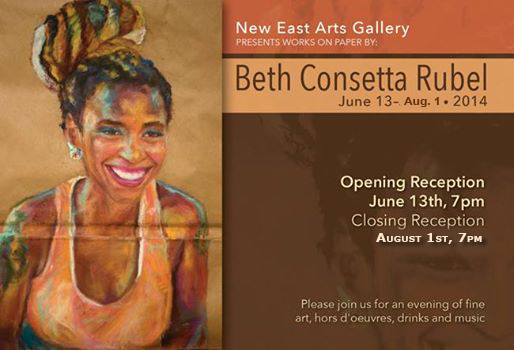 Please join us at New East Arts Gallery for visual artist Consetta Rubel’s exhibit entitled, “Works on Paper,” a series of portraits on brown paper bags along with a number of unique drawings. Consetta works with chalk, acrylic, and found objects to create a “pop-up effect that speculates the irony of subtle racism that shapes our society.” Born and raised in Texas, Consetta draws upon the consciousness of the Deep South and pop culture in her pieces, seeking to evaluate philosophical questions and contradictions. An opening reception with food and drinks will be held June 13th, the exhibit will run until August 1st. New East Arts Gallery is DiverseArts’ fine art gallery, dedicated to showcasing Austin’s emerging and established visual artists. Very much a mission-driven space, the gallery takes a multicultural, multimedia approach to presenting local artists who represent the diverse cultural communities living in Austin, with a special interest in providing exhibition opportunities for artists of color. I was raised in a small town in Texas settled by Germans. My parents moved frequently to deflect discrimination they faced for being in an interracial marriage. The experience growing up as a biracial child was impregnated by intolerance from classmates, family members, and occasionally teachers. I draw upon my personal narrative and am highly influenced by diversity, assimilation, and stereotypes in American culture. The intersection of race and pop culture are fundamental components that invigorate my paintings. The process of rummaging thrift stores to find antique photos, yellow and curling at the edges, vintage postcards, and cast iron objects with a history are a bases for my work. Nostalgic blues music and rhythmic jazz shape the atmosphere in which I work. I explore and dissect Deep South mentality, black face minstrel shows, and the stereotypes present in all outlets of media. I aggressively approach my paintings with an expressive application. I utilize layers of chalk pastel, acrylic, gouache, fabric and found objects and assemble paper cut outs to create a pop-up effect that speculate the irony of subtle racism that shape our society. Is racism permanently embedded in our culture, or is it a learned behavior that is exploited in media and fed to the masses? The subjects of my works include both historical and mainstream imagery that evaluate these questions and embrace contradictions that are philosophical, sexual and emotional.